Both men’s and women’s basketball have high title hopes before they start CCAA postseason action on Thursday in first round match-ups. UCSD women’s basketball is currently the hottest team coming into the California Collegiate Athletics Association tournament, riding a seven-game winning streak that included victories against top-seeded Cal State Dominguez Hills at home and against second-seeded No. 15 Humboldt State and fifth seed Cal State Stanislaus on the road. The Tritons hold the fourth seed and a 16–6 conference record (18–9 overall), and will face Cal State San Bernardino (14–8), the fifth seed, in the first round of the CCAA championships. UCSD split the season series against Cal State San Bernardino earlier, losing 56–64 at home on Jan. 23 and winning 64–61 just this past weekend on Feb. 28. The Tritons will come in with momentum on their side after winning their last matchup to cap off their seven-game win streak to end the season. The Coyotes, on the other hand, concluded on a pair of losses. However, in spite of being the lower seed, San Bernardino is still a force to be reckoned with. The Coyotes are led by junior guards Alexcia Mack, Chelsea Barnes and Brianna Harden who average 13.5, 12.3 and 12.3 points per game, respectively. They also own the best defense in the league, allowing a league-low 58.9 points per game, which promises quite a battle with the Tritons’ offensive firepower. In their January matchup, Cal State San Bernardino limited UCSD to only 32.3 percent shooting from the floor, as the blue and gold struggled to get anything going. However, the Tritons are now a different team, as demonstrated in last week’s win, in which UCSD’s cohesiveness and growth as a squad were on display. Although the game remained close and even, UCSD grinded out the victory. This Triton team is also one of the most experienced in years, with six seniors who just celebrated Senior Night two weeks ago. However, UCSD is truly led by standout junior forward Farrah Shokoor, a transfer from San Francisco State playing her first season with the team. Shokoor leads the league in rebounding at 12.4 per game, a full three boards over the next best. She is also in the top 10 in scoring, blocked shots and steals, leading the team in all these categories. She is supported in her efforts by senior guard Miranda Seto, who also scores in double digits per game. Senior center Dana Webster and senior forward McKennan Bertsch (who leads the league in field goal percentage, at a ridiculous 69.5 percent) combine with Shokoor and Seto to create a truly terrifying frontline at the league level. Sophomore guards Haley Anderson and Beth Mounier, along with redshirt freshman guard Taylor Tanita, also contribute to make it a very deep and talented team, with power inside and accuracy outside. UCSD is one of three teams (behind Cal Poly Pomona and Humboldt State) to score over 70 points a game, and allow a league low 10.5 assists per game — a testament to its team’s defense. The Tritons suffered a slow start to the season after the initial period of acclimation with new blood joining the team. However, after finding its groove, UCSD rode a five-game win streak and a later seven-game win streak to post the 16–6 record. Especially in recent weeks, the Tritons appeared to be firing on all cylinders. Through the 2015 campaign, UCSD has defeated every other top-6 team at least once. The top two teams, Humboldt State and Cal State Dominguez Hills, have identical 19–3 records to combine for only six conference losses. UCSD is responsible for three of them, being the only team to win against Humboldt State this season and sweeping the season series over Cal State Dominguez Hills. If UCSD is to defeat San Bernardino, the Triton women would move on to face top-seed Dominguez Hills in the semifinals with history on their side. Having led UCSD to a conference crown just two years prior, VanDerveer hopes to avenge last season’s early postseason exit this year. With a cast of highly talented players, 2015 looks like it could be the time to reclaim the throne. With the conclusion of the California Collegiate Athletics Association’s regular season, the UCSD men’s basketball team looks to keep its season alive when it faces off against fourth-seeded Cal State Stanislaus on Thursday, March 5, in the first round of the CCAA playoffs. The Tritons finished the season with a 16–10 overall mark and a 14–8 conference record, good for fifth in the standings. The Tritons rank first in the CCAA for defensive rebounds, second for most made threes and third in points allowed. UCSD also commits the lowest number of turnovers in the CCAA. Cal State Stanislaus also finished 14–8 in conference, however, holding the tiebreaker against UCSD. Stanislaus was also the fourth seed for last year’s CCAA postseason, where it ended up going all the way and winning the CCAA crown on a seven-game win streak. The Tritons were one win shy of the playoffs last year. This year’s CCAA playoffs will be hosted at the Stockton Arena in Stockton, California after having the tournament held in Ontario’s Citizen Bank Arena for the past two years. With the Stanislaus campus only 45 minutes away from the arena, the Warriors look to feed off the crowd as the game will practically a home game. Stanislaus also comes into Stockton with some strong momentum, currently riding a three-game win streak. The Tritons are on a roll of their own, winning four out the last five games. 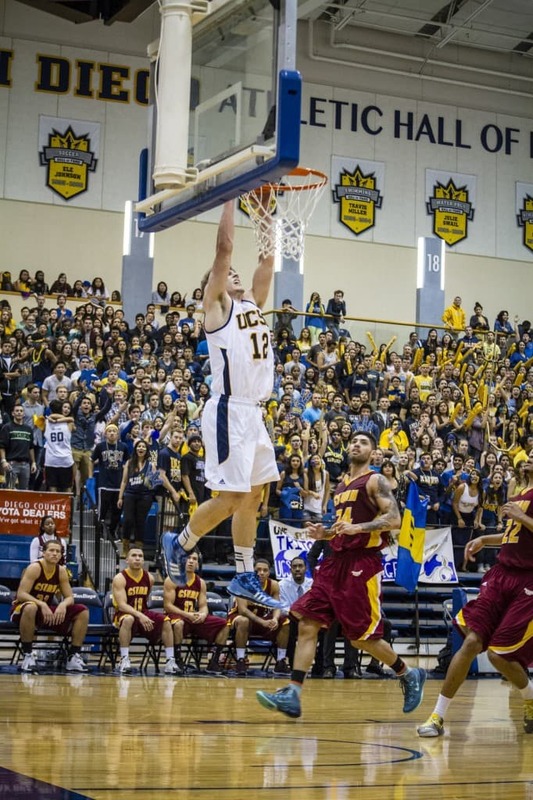 Earlier, UCSD was swept in the regular season matchup against Cal State Stanislaus. The Tritons suffered a 48–53 defeat at La Jolla, then a heartbreaking 66–67 double overtime loss at Stanislaus. The blue and gold struggled offensively in both of its matchups against the Warriors. In those two games, the Tritons shot an average of 36 percent from the field, 9 percent lower than their season average of .445. The Tritons struggled especially from deep, hitting only 4–22 from three-point territory in their first matchup and shooting a subpar 32 percent in their second. Despite a pretty uneven campaign, UCSD has by far exceeded preseason expectations. Having been pegged to finish ninth in conference from a preseason poll, UCSD has crafted quite the surprisingly impressive 2015 campaign. The Tritons started their conference schedule with a few losses, but a six-game winning streak in the middle of the schedule helped them launch their season’s success. 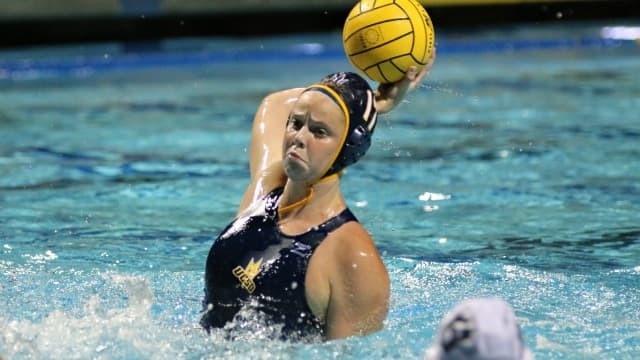 UCSD then suffered a few other disappointing losses, but won four out of five coming into the postseason and looks as dangerous a squad as there is. UCSD scores 67 points per game and allows only 61.5. The men’s team is led by junior guard Hunter Walker, sophomore guard Adam Klie and junior forward Drew Dyer, who are all scoring in double figures. Dyer is the Tritons’ best three-point shooter and ranks in the top five in three-point percentage for the conference. Klie and junior center Zach McMillan also grab over five rebounds a game for the Tritons. Klie is in an incredible stretch run that ranks him third in overall shooting percentage in the league, an amazing feat for his position. His sudden emergence as one of the best guards in the league is a big reason for UCSD’s playoff-clinching season. However, aside from the likes of Walker, Klie and Dyer, the Tritons have truly found success operating as an ensemble, with various players stepping up each night, such as sophomore guards Aleks Lipovic and Jeff Van Dyke. Even newcomer freshman guards Grant Jackson and George Buaku have contributed in clutch moments. The top six teams of the 12-team conference will compete for the CCAA Championship and a bid for the Division-II National Collegiate Athletics Association playoffs. If UCSD advances to the semifinals, conference leader Chico State University, who along with second-seeded Cal Poly Pomona, earned a first-round bye, will await the Tritons. 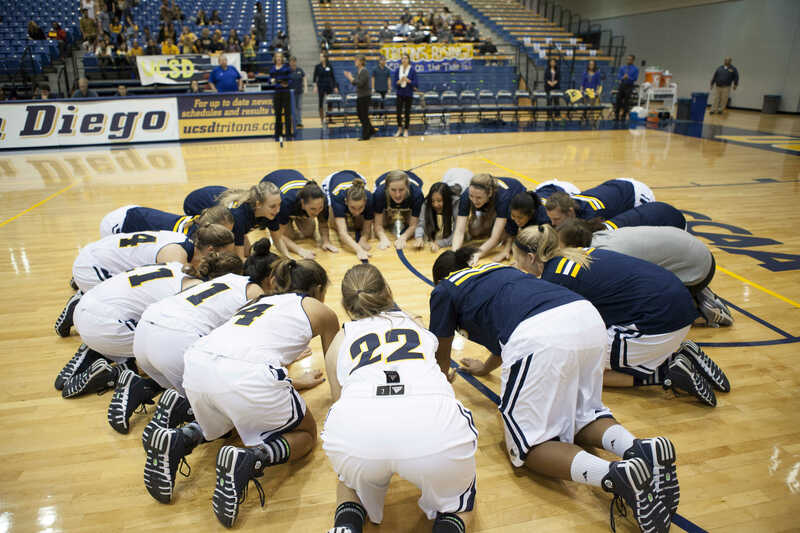 UCSD had split its regular season matchup with Chico State. Third-seeded Humboldt State will square off against Cal State San Bernardino on Thursday. The Lumberjacks will look for their first win against San Bernardino, the only CCAA team that they could not defeat this season. The winner of that game will face off against Cal Poly Pomona in the semifinals. The game between UCSD and Cal State Stanislaus will tip-off 5:30 p.m. on Thursday, March 5 , while the potential matchup against Chico State will take place at 5:30 p.m. the following day.